Bad habits are hard to break as is developing one, it’s often said, and that’s true. But with a little bit of help you should be able to overcome it. Funn Media is trying to do that with HabitMinder. If you have ever tried to make a New Year’s Resolution, you know how hard they can be to keep, so this might help. There are a lot of habits that you may want to focus on, but the most likely are exercise, take vitamins, eat veggies and the like. The free version allows you to track a limited number of habits simultaneously, while the pay version offers more. For many users the free edition should be fine, and at the very least it helps you determine if it’s worth buying or not. To choose a habit to track, tap the plus button. Several habits are built in and they are divided into various categories. The classification are Commit, Appreciate, Healthy Habits, Mind and Body. Once you choose an option, i.e. body, habits like walk, run, exercise will appear. 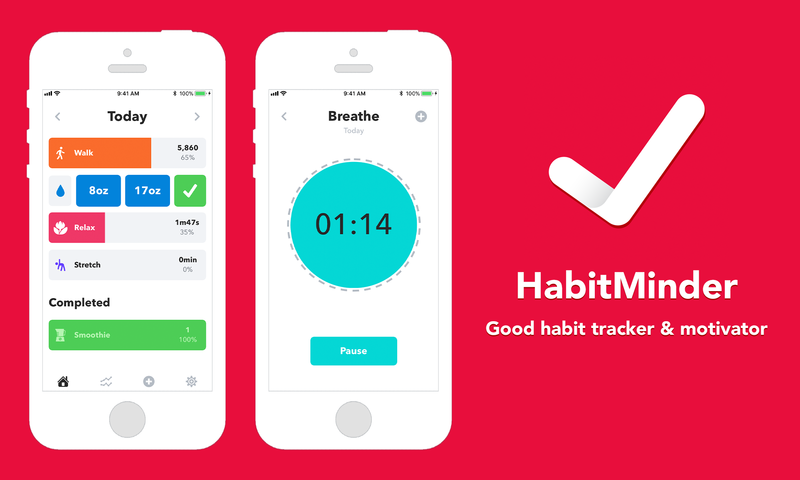 The app also keeps track of the habits that you’ve performed for the day. If you set to drink 8 glasses of water daily, the notifies you when you’ve done this. You can customize the notification sound, frequency and other particulars. There is of course an option to add your own custom habit. You won’t be faulted for thinking it works like a reminder, but HabitMinder is more efficient.